Happy St. Patrick’s Day! What began as a religious feast day in the 17th century has evolved into a variety of events celebrating Irish culture around the world with parades, special foods, music, dancing and a whole lot of green. We thought about turning the Merrimack River green for the holiday like they do in Chicago, but then decided a fun festive candy table might be more helpful in your celebrations. Visit us for all your St. Patty Day candy and leprechaun treats. Green, white and even rainbow! Visit us in store. We have many colorful Easter Baskets made with top quality treats and gourmet chocolates. Also new this year – have us assemble your Easter basket. Easter is April 1, 2018. • Pick out your bow color. • Pay for basket, candy, $1.50 for bag, bow, fill and grass. Plus $1.00 for us to assemble. • Then let us do the rest. • Pickup before close of business Saturday, March 31 at 6 pm. • Taking orders thru Saturday, March 17, 2018. We look forward to seeing you and Happy Easter! Jelly Belly Beanboozled Jelly Beans are 10 years old this month! What?!? Did you know: barf flavor started out as pizza that was intended to be good – but it wasn’t! Pro tip: always end with toothpaste or berry blue flavor. 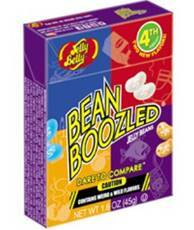 Try Jelly Belly’s 4th Edition mix of weird and nasty flavors mixed with regular ones. Makes a great game! Most memorable flavors per Jelly Belly are stinky socks, barf and rotten egg. Do you agree? What are your most memorable favorites? No more lemon creams unless you want them! Some surprises are good, and some are not so good. Do you hate throwing out all those “not so good flavors” from those pre-assorted heart boxes? 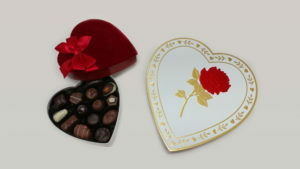 Take the waste out of Valentine’s and visit Pearls Candy NH to create a custom heart with just the ones you want. 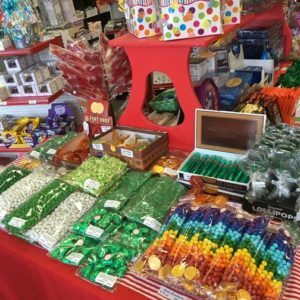 One stop shop for all your Valentine candy and chocolates. Everything from almond butter crunch to cashew turtles or chocolate covered cherry cordials. Chocolate covered Oreos to English toffee to peanut butter cups. Yum to all of it and to everything in between. The awards season is officially under way with the announcement of the 75th Golden Globe contenders. 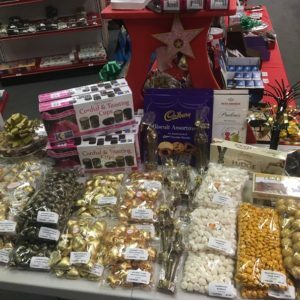 Visit Pearls Candy NH for everything you need for a tasty Golden Globe party. 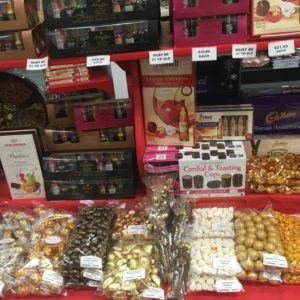 We have gold Lindt truffles, gold candies, gold foiled gourmet chocolates, Jelly Belly champagne bubbles, gold dusted solid milk chocolate awards, and filled chocolates (uhm, for those over 21 years of age) or cordial toasting cups for your own signature cocktails. Hopefully all your favorites win! Christmas came early with Holiday party favors from Pearls Candy NH. We had a great time working with you! Thank you for thinking of us and for sharing your hard work. Warm wishes for a terrific holiday and 2018! Congratulations to the winners of a free pair of tickets to next week’s matinee “A Christmas Carol!” All winners have been notified. Enjoy the show and thank you again for your business. Happy Holidays! Happy Holidays Donna and thanks again for asking! Celebrate Christmas this season with a free pair of tickets to see “A Christmas Carol” at North Shore Music Theatre in Beverly, MA. Visit us at Pearls Candy NH located at 356 S Broadway, Rt 28, Salem, NH, to put your name in the candy jar to win your pair. 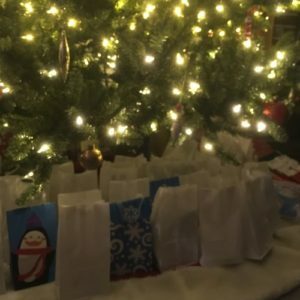 North Shore Music Theater, Pearls Candy NH and The River 92.5 are giving away 5 free pairs of tickets to see “A Christmas Carol” Saturday, December 16th. All tickets are for the 2:00 PM matinee performance. Winners will be notified Saturday, December 9th via phone call. Visit us in store to enter now. Visit us for those additional or unique decorating ideas for your gingerbread house. Below is a short list. We have so much more in our store @ 356 S Broadway, Salem, NH or online @ candynh.com. M&Ms make colorful tree ornaments – we have minis too! Send us your ideas and/or share your photos.